What is the true cause of your hip pain? Trochanteric bursistis or as it is often referred to, greater trochanteric pain syndrome (GTPS) affects between 1.8 and 5.6 patients per 1000 per year. GTPS is a common condition with pain and tenderness at the outer edge of the hip (approximately where your pant pocket is). Quite often people affected by trochanteric bursitis complain of hip pain when walking particularly uphill walking. 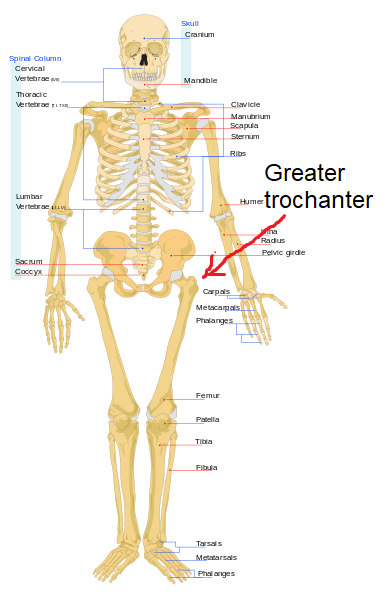 To better understand this, the greater trochanter is a large quadrangular bony projection that sits on the top part of the thigh bone (see the image on the right-hand side). It is a very busy part of the body. It is the main attachment for the strong gluteus muscles, which facilitate the complex movement such as abduction (bringing the leg away from the body) and outward rotation of the femur. It also houses a large quantity of bursae. A bursa is a fluid filled sac that prevents the tendons from rubbing over the bone and eventually tearing. The three bursae that occupy the outer (lateral) aspect of the hip are the gluteus minimus bursa, subgluteus medius bursa and the subgluteus maximus bursa. Trochanteric bursitis is more frequent between the ages of 40 and 60, predominantly female and possibly related to pelvic bio-mechanics. Other possible factors contributing to your hip muscle pain include the acuity of the femoral neck shaft angle, the shape of the hip socket and repetitive friction between the greater trochanter and the iliotbial band (ITB). It should be noted that individuals with trochanteric bursitis often have co-existing hip joint osteoarthritis or low back pain. Some individuals have a higher than normal body mass index, which is a likely contributing factor to GTPS. GTPS encompasses a range of causes including gluteal medius and minimus tendinopathy/tears, trochanteric bursitis and ITB friction. An exact cause remains unknown. There is often co-existence of both bursitis and tendinopathy. In a study consisting of 877 patients with GTPS, 700 (79.8%) did not have bursitis on ultrasound. A minority of patients (177, 20.2%) had trochanteric bursitis. Of the 877 patients with greater trochanteric pain, 438 (49.9%) had gluteal tendinosis, four (0.5%) had gluteal tendon tears, and 250 (28.5%) had a thickened ITB. The researchers concluded that the cause of greater trochanteric pain syndrome is usually some combination of pathology involving the gluteus medius and gluteus minimus tendons as well as the ITB. So in a nutshell not all GTPS’s necessarily involve trochanteric bursitis. In fact the actual trochanteric bursitis is present in only the minority of patients. The authors explain that fluid in the greater trochanteric bursa is secondary to a gluteal tendon tendinopathy or an ITB problem. Exercise is the most usual treatment for tendinopathy. A specific exercise called eccentric loading is more effectiven than a generic exercise regime. Eccentric exercises are specific, deliver greater but controlled load and provide effective resistance exercises, while, at the same time reduce pain and normalize tendon structure. Shock wave therapy (SWT) has been shown to be effective for tendinopathy and in particular for GTPS. Corticosteroid injection is the second line of treatment. Although there has been debate whether bursal corticosteroid injection improves long-term pain in greater trochanteric pain syndrome. The good news is that most cases resolve with conservative measures, with success rates of over 90%. A few cases persist despite treatment and time; these cases may require surgical intervention in the form of bursectomy, iliotibial band (ITB) lengthening techniques or gluteal tendon repair. In conclusion GTPS can be a combination of different structures and pathologies that is causing pain around the lateral aspect of the hip. Conservative treatment is the gold standard for GTPS with over 90% success rate.